Location: about 4 hours from San Jose via the Pan American Highway west to Atenas. Through the mountains to Orotina. Turn off at Jaco, to Quepos, then 5 miles to the park. Facilities: Manuel Antonio ranger station open from 8am to 4pm with drinking water and restrooms. Manuel Antonio National Park is possibly the most visited park in Costa Rica and now limits visitors to 600 per day (800 on weekends) and is closed on Mondays. There are 4 main beaches — Espadilla Sur, Maneul Antonio, Escondido and Playita, the prettiest is Playa Manuel Antonio that has coral-white sand and a small coral reef. 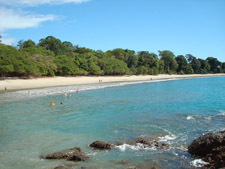 Playa Manuel Antonio is separated from Play Espadilla Sur by a white sand natural bridge, named by the locals as "Tombolo". This sand bar connects the mainland to the small island of Punta Catedral. Tidal pools at these beaches are filled with minnows and crayfish. With plenty of trails throught this park, hikers are sure to enjoy the sights. The Perezoso Trail offers sightings of marmosets, ocelots, pacas, spectacled caimans and river otters.